I hate to see Disney trademarked characters appear on the kids' pages for government websites, given that the Disney corporation has been at war with the concept of the public domain for decades, as the company supports draconic legislation that may preserve for perpetuity their lucrative copyrights on their fairy tale material -- much of which ironically originated in folktales that were appropriated for free. First the Department of Homeland Security plugged the Muppets, which have been licensed by the Disney corporation for many years. 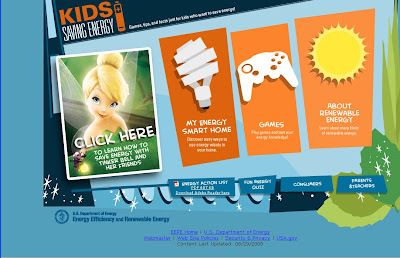 Now the webpage for energy.gov/tink gives the company more free advertising at taxpayer expense, as those at the Energy department use Tinkerbell as a spokesperson for energy conservation in the home.